BW883-G smart wireless door lock is designed and built specifically for the hotel industry. It is intelligent and stand-alone, and can be operated by many ways, for example mobile phone, computer and card. 1. Type 1: BW883SC/G-G, stainless steel wiredrawing with golden edge color. 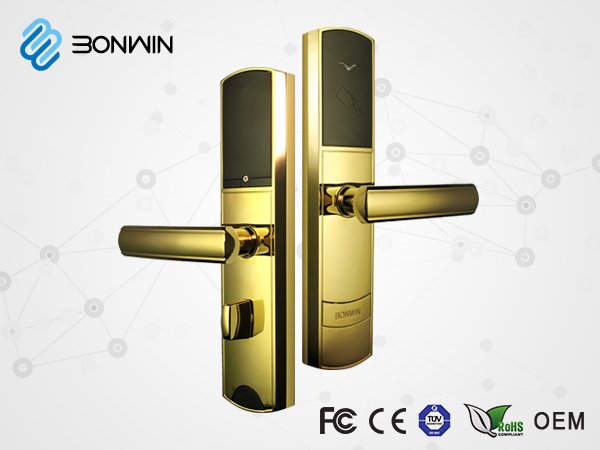 A controller of BW883-G wireless door lock can control 50~100 locks! 2. Type 2: BW883SC-G, stainless steel wiredrawing color. BW883-G is another product which is designed for large hotel using ANSI mortise. 3. Type 3: BW883BG-G, bright gold color. There are three types of BW883-G available for you to select. ◎ Integrate easily, BW883-G wireless network lock provides COM+ technology interface and a test DEMO program, making the ordinary Wifi, Bluetooth, mobile phones and walkie-talkie completely staggered to avoid interference with the lock communication. ◎ 111111With intelligent cloud platform,it is easy to unlock with 5 ways: APP, RF card, Wechat, computer and mechanical key. ◎ All need in on card: The card of BW883-G wireless smart lock can open hotel door lock, the elevator and others, which is much more convenient for more customers. ◎ OPENA software, BW883-G has been successfully docked with OPENA software, which makes the hotel lock system run better.